We are sure that you have been reading about Microsoft’s strong move to encourage all enterprise users to the cloud including the consolidating of voice in the “Microsoft Phone System” (Cloud PBX) coupled with Microsoft “Calling Plans” (PSTN Calling) into Office 365 as one product, but is it really a good fit for your company right now? Did you know Microsoft consolidated “Microsoft Phone System” and “Calling Plan” to Office 365? As many companies take advantage of Office 365 and move into the cloud, Microsoft is encouraging them to take their phone systems with them. By offering the “Microsoft Phone System” (Cloud PBX), users can make calls from Skype for Business in Office 365, utilizing either the native Microsoft “Calling Plan” (PSTN Calling) or with a hybrid offering using their own PSTN service provider. By doing this, companies can consolidate all their communications into one product. What is CCE, and why did Microsoft offer this as a solution? Microsoft have two PSTN calling hybrid options. An “On-Prem” hybrid for companies with existing On-Prem Skype for Business infrastructure and Cloud Connector Edition (CCE), with a minimal on-premise deployment. *For companies with a cloud first strategy neither is viable due to the local hardware requirements. Why companies might not want to go all-in with MS Office 365 Cloud? Microsoft currently only supports PSTN calling in 9 countries. If you are in a country outside of the supported countries Hybrid is the only solution. The user based pricing model of Microsoft is not competitive for large organisations with a significant number of employees but with few who are regular telephony users. Not all the necessary PBX replacement functionality is in the Microsoft Cloud PBX to meet the needs of more complex telephony users. A poor support model for resolving porting issues and voice quality issues in an effective manner. Building on our proven record with hybrid solutions, global reach, competitive routing, and a customer service level that other providers cannot match. Pure IP’s model is to be a complementary voice partner to companies moving to Office 365 by choosing to retain our services while getting the infrastructure benefits of cloud solutions. Furthermore, our approach is to provide flexible services that meet your changing business needs, while providing you with a solution that will scale but more importantly, it gives a path forward without long-term commitments to particular technological path or investment. Pure IP’s offering is to host the CCE infrastructure within the Pure IP Cloud. This removes any local infrastructure requirement and in so doing, you derive the benefits of Pure IP SIP trunks for calling and the attendant costs beyond the Skype for Business Federation, and you gain the benefits of users housed in the office 365 cloud or on-premise. 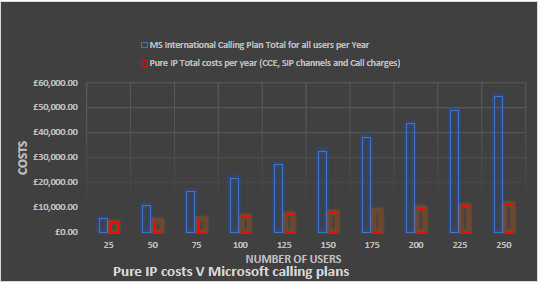 There are also cost benefits for many enterprise customers: Microsoft Calling Plans are charged at a “per user” rate for a set number of pooled minutes, where as Pure IP charge for required base services and actual calling usage. As your organisation grows more than 20-25 users, this can be a costly solution to expand your telecommunication services since the E1, E3, and E5 licenses that incorporate the Cloud PBX element and voice plan can cost between £30.00 – £48.00 per user, per month. Pure IP has provided a graphical example below of the savings that can be achieved over the year, based on the size of the company making global calls. We install, manage, and host the CCE software; freeing you up to work seamlessly through Office 365, provide you access to DID numbers from over 32 countries, and all while retaining quality voice services. Please contact Pure IP so we can provide a more in-depth analysis and advise what can be achieved for your organisation.